HDMI over CAT5 Network Wire Receiver Works up to 50m! HDMI was limited to roughly 6 meters or 20 feet, which limited your home entertainment hookups. Who keeps all their home entertainment equipment just 20 feet away? This is especially true if you have multiple rooms and you want to share HDMI components across multiple rooms or floors. Well, a solution to this problem just launched today. Tributaries Cable, provider of high-performance cables, accessories, and installation solutions for audio, video, and custom-install systems has come out with the HXC5 HDMI over Cat5 system. It uses Cat5 network cabling - yes the same network cabling you use for your home network - to transmit the HDMI signal up to a whopping 50m. This is truly a momentous problem solver for many modern home theater systems. It even uses the same standard RJ45 connector and pin outs, so you can crimp your own network cable rather than paying for an expensive crimped network cable. The Tributaries HXC5 provides a simple solution for sending an HDMI signal over distances up to 50 meters (164ft) virtually loss-free. The HXC5 requires a double-run of low-cost, flexible, easy-to-run standard CAT5/5E/6 network cabling. The HXC5 employs balanced/unbalanced signal processing ensuring full hi-def signal integrity for all video formats up to and including 1080p, and is HDMI v1.2-and HDCP compliant. The HXC5 is packaged as a complete, ready-to-connect system, including a compact “balun” transmitter (source-end) and receiver (destination-end), each measuring 5”x5”x1”, and two 5-volt power supplies. Installation is as simple as plugging and playing. Tributaries latest high-def video solution is now available and it'll set you back $600. A bit hefty, but certainly a worthy sacrifice that home entertainment/videophiles are certainly willing to pay in order to save every precious and beauteous high-definition video bit. Verizon FiOS Voice+Internet Cheaper than just FiOS Internet? \nHDMI was limited to roughly 6 meters or 20 feet, which limited your home entertainment hookups. Who keeps all their home entertainment equipment just 20 feet away? This is especially true if you have multiple rooms and you want to share HDMI components across multiple rooms or floors. \nWell, a solution to this problem just launched today. 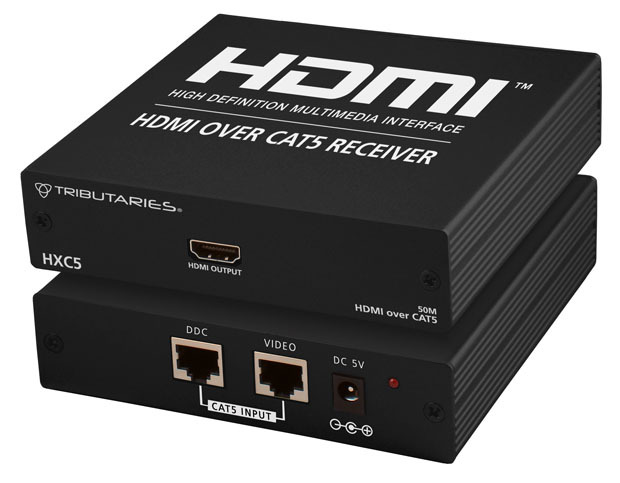 Tributaries Cable, provider of high-performance cables, accessories, and installation solutions for audio, video, and custom-install systems has come out with the HXC5 HDMI over Cat5 system. It uses Cat5 network cabling - yes the same network cabling you use for your home network - to transmit the HDMI signal up to a whopping 50m. This is truly a momentous problem solver for many modern home theater systems. It even uses the same standard RJ45 connector and pin outs, so you can crimp your own network cable rather than paying for an expensive crimped network cable. \nThe Tributaries HXC5 provides a simple solution for sending an HDMI signal over distances up to 50 meters (164ft) virtually loss-free. The HXC5 requires a double-run of low-cost, flexible, easy-to-run standard CAT5/5E/6 network cabling. The HXC5 employs balanced/unbalanced signal processing ensuring full hi-def signal integrity for all video formats up to and including 1080p, and is HDMI v1.2-and HDCP compliant. The HXC5 is packaged as a complete, ready-to-connect system, including a compact “balun” transmitter (source-end) and receiver (destination-end), each measuring 5”x5”x1”, and two 5-volt power supplies. Installation is as simple as plugging and playing. \nTributaries latest high-def video solution is now available and it'll set you back \$600. A bit hefty, but certainly a worthy sacrifice that home entertainment/videophiles are certainly willing to pay in order to save every precious and beauteous high-definition video bit.